That's a perfect card for her, fun card! Great rub on too! Have a nice weekend! This is sweet! I absolutely loved that Stampin' Up! pirate stuff while they had it... I never got it because I figured (rightly so) that the boys would grow out of the pirate stage. Now we are onto super heroes! 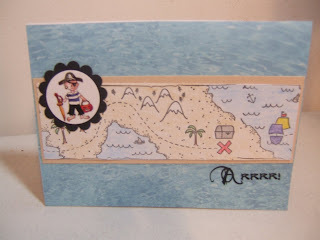 Cute Pirate card Chrissy! Ican see why your sister really liked it! Wow! I can't believe that center part is from a stamp. I bet it took a while to color in. My son is dressed up as a pirate in the Halloween scrap page I posted today. My rub-ons never turn out very good, so I tend to use stickers even though they may not look as good. Hey, maybe that's what my stocking needs! A sticker or two. The card looks amazing Chrissy, the coloured stripe looks amazing.